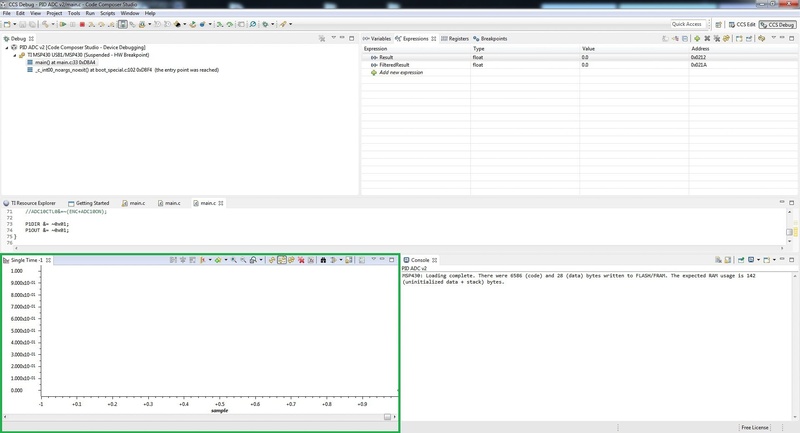 In this Code Composer Studio graphing tool tutorial, graphing variables will be demonstrated in Texas Instruments IDE. The process is fairly straightforward and will be shown in a video as well as some screenshots so it can be easily replicated. For the demonstration a program running on the MSP430G Launchpad was used, with the MSP430G2553 fitted. The Launchpad was connected to a small experimental PID boc I have constructed, which I call the ‘Pocket PID’ (tutorial to follow on this), the box uses a LM35DZ temperature sensor as well as a few other components. The voltage from the LM35DZ is sampled and then two variables are generated; a variable called Result which is comprised of a raw data set of several over samples and a variable called FilteredResult, which is a digitally filtered version of the Result variable. Both variables can be viewed side by side which allows the effectiveness of the digital filter to be observed, the box also has a small heater and fan which allows the variables rate of change to be viewed over time in a graphical format. 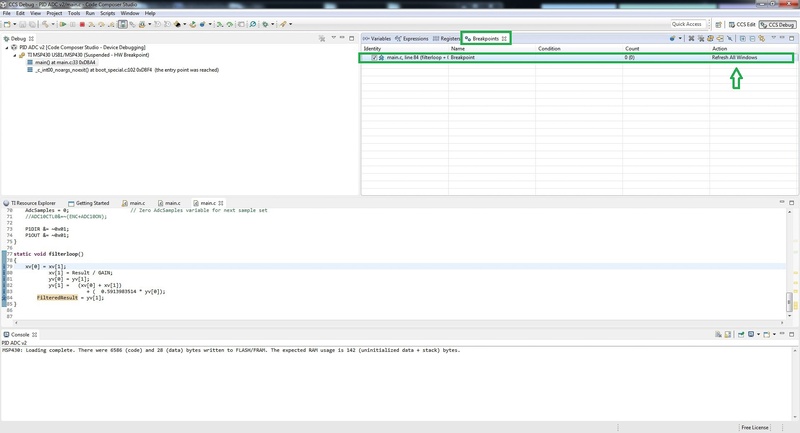 This provides a good example of how the code composer studio graphing tool can be used. 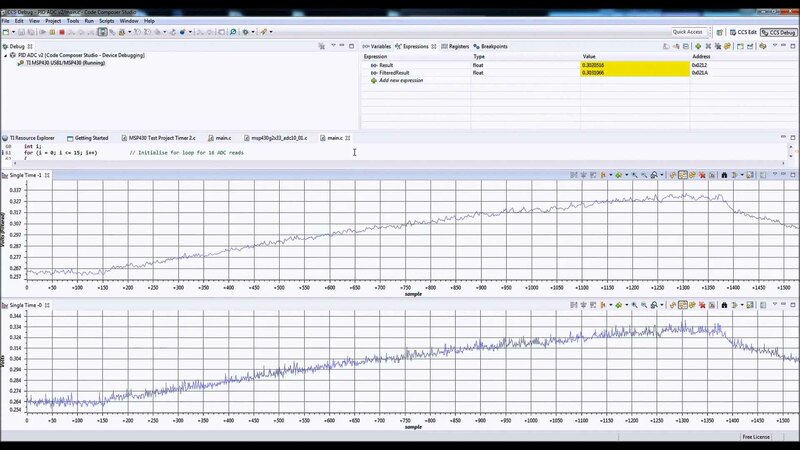 The graphing tool can also bee seen in action on another tutorial based on the C2000 Launchpad, where it is used to view the operation of an solar MPPT, graphing the power, voltage and PWM duty cycle. The third part of the article concerned with this can be found here and the YouTube video here. The main steps to access the the graphing tool in code composer studio (CCS) are carried out in debug mode, so all the screenshot images below are taken from within that mode. As with all software there are often other ways to achieve the same results, this is just a method that works for me. The first step is to decide which variables you want to graph and add these as Watch Expressions in CCS, this is achieved by highlighting the variable and then right clicking to bring up a properties menu, from this menu you want to choose the Add Watch Expression selection. This is shown in the below image. If this has been successful then the variable chosen should then appear in the Expressions window, which is shown in the next image. You can add as many watch expressions as necessary, the video demonstration shows two variables being watched and graphed, but I have successfully watched and graphed four expressions. I am not sure if there is an upper limit, but i have noticed stability issues when many variables are being watched over a long period of time. After adding the variables required to the watch expression window, the next step is to add breakpoint and then edit the breakpoint properties. 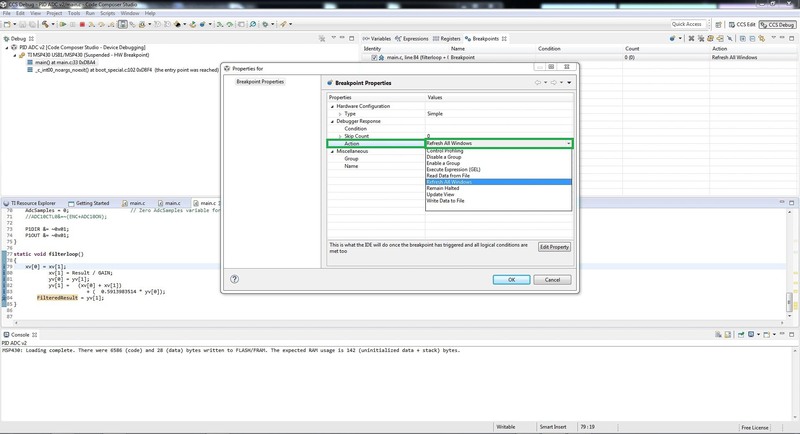 Adding a breakpoint can be achieved either by double clicking on the line number, or highlighting a section of code on the line number and right clicking, then selecting the Breakpoint (Code Composer Studio) and Breakpoint option. The image below illustrates this action. 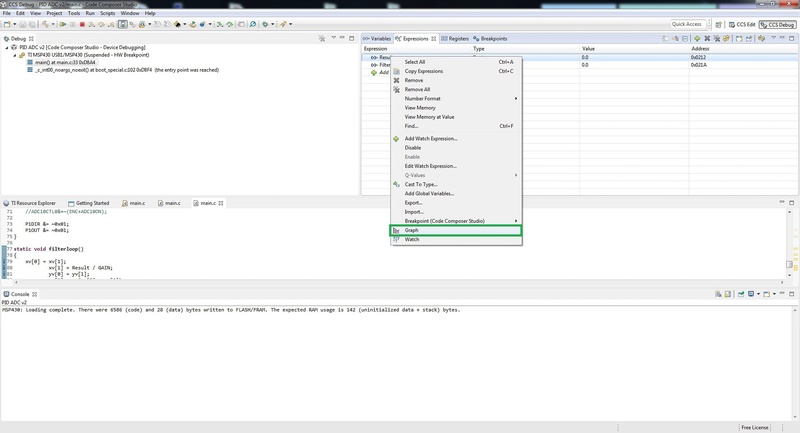 Once the breakpoint has been added it should be visible in the Breakpoint window, for the breakpoint to be enabled it needs to have a tick in the far left column. The image below shows the breakpoint window with the tick in the far left column, as well as an arrow highlighting the Action column. A breakpoint by default will halt the program at the chosen point, for the graphing tool to work all the windows simply need to be refreshed, this then allows the Expressions window and the graph to be updated. The next image illustrates how this is achieved by editing the breakpoint properties. I simply right click on the breakpoint symbol shown next to the line number it will activate, this then brings up a properties list and then select the Breakpoint Properties option. The image below shows this then step. Once the Breakpoint Properties window is open there are a few options that are accessible, for this tutorial only one is of interest which is the Action property. As already mentioned the action the breakpoint will carry out by default is half the program, for the watched expressions to update, this action simply needs to be changed to Refresh All Windows. The next image illustrates how this is changed. 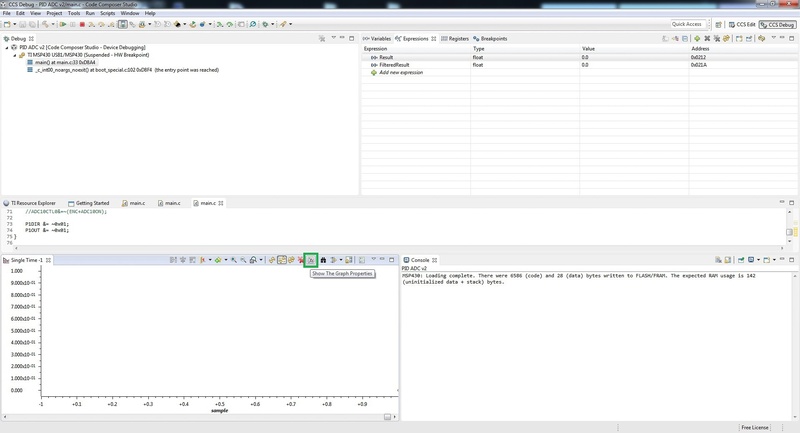 Now that the variables have been added and a breakpoint has been placed and set-up to perform the required action, the variables to be graphed can be chosen and set-up. To bring a graph up for a particular variable, right click on the variable in the Expressions window and then select the option Graph, as per the image below. Once the graph option is selected the graph should be visible in CCS, I find it usually defaults to the bottom left of the window, as shown in the next image. The graph window can be manipulated to the required size as well as being picked and placed as required. Additional graphing windows can be added for other variables in the same way. Now the graphing windows also has various options which allow you to tailor the view for your requirements, by hovering over the symbols small tooltips will appear which give a good impression of the button’s action. This tutorial will only cover two of the buttons which provide enough of an introduction for now. The first button is the Graph Properties button which is shown in the image below. By clicking this button a new window will open which displays some useful quick access properties. I usually use the Grid Style option to add a Major Grid to the x and y axis, additionally the Display Data Size option allows you to determine how much data is viewable on the graph, before it is pushed off the edge of the screen. For long data captures increasing the Display Data Size can be useful, I have had issue with instability here though so its compromise on other settings such as Sampling Rate Hz as well as other settings for CCS when in debug mode. The Graph Properties window is shown in the next image. The next button that will prove useful is the Graph Display Properties button, this is shown in the next image (also note the Major Grid now shown on the graph window). The Graph Display Properties window again has quite a few options, allowing things like colour, number formats, axis names and scale to be changed. 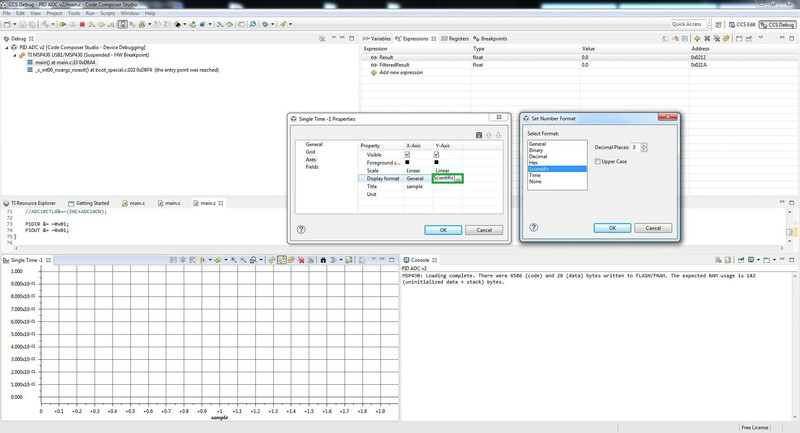 Some of these options are demonstrated in the video, the image below shows the Graph Display Properties window and the option for the Y axis Set Number Format option window open. 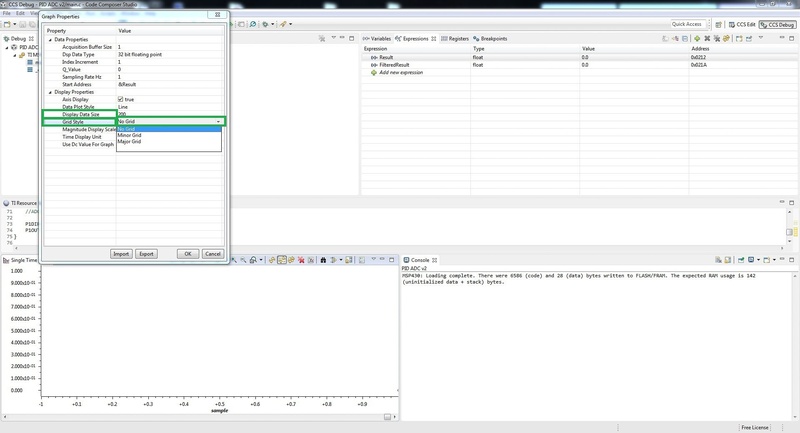 The final image shows a screen capture from the video, with both sets of data displayed side by side. I take great care when writing all the tutorials and articles, ensuring all the examples are fully tested to avoid issues for my readers. If you have found this useful or have any problems implementing, please feel free to leave a comment and I will do my best to help. In this PID tutorial C code example Pt/2, the basic concept of a Boost PID controller will be explored. All the PID controller C code is stepped through, as well as some basic concepts for testing and tuning the controller. The final C code example can be downloaded via the link at the end of the article. The image below shows a rough blocked out diagram of the boost circuit and feedback loop. As can be seen it’s a fairly simple design, with the output voltage being monitored and fed back to the LM3S6965. A schematic for the boost converter can be seen below, this circuit was originally made to test a variable voltage boost converter. The original design would use a 5V input which would then be boosted to either 9V, 12V or 15V, this was controlled via a state machine running on the Stellaris LM3S6965. 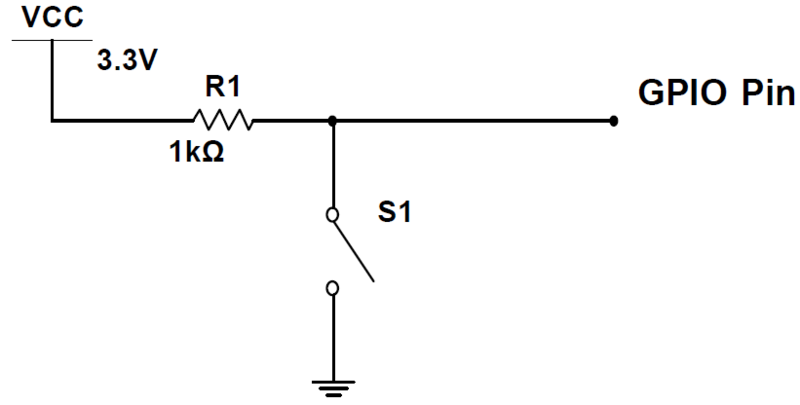 The drive circuit for the mosfet uses 2 transistors in a totem pole configuration, and a 3rd transistor is to ensure a small current is sourced from the LM3S6965. The main boost circuit itself consists of L1, Q1, D1 and C3. The sampled output voltage via the potential divider is first passed through an operational amplifier U1A, configured as a non inverting amplifier which provides a gain of 2.2. The operational amplifier U1B acts as a unity gain buffer, it’s input is connected to 3 resistors R7, R8 and R9. These 3 resistors provide the offset voltage of 770mV and U1B ensures there is a high impedance input. The output of U1B feeds the offset voltage to R4 and then to the negative input on U1A (effectively offsetting ground). The boost converter was originally set-up to measure voltages between 4V and 19V. So the operational amplifier arrangement with offset, ensures the sampled voltage range uses almost the full range of the ADC. For the PID testing the output voltage will be regulated to 9V, which is equal to 353 on the ADC which is also the set point value. The software used was written after reading various sources on PID. It has been designed so it is easy to understand, as it uses local and global variables. A more efficient way would be to use a typedef structure or typedef struct in C.
So firstly we have our constants and global variables. In the first part of this tutorial the proportional (Kp), integral (Ki) and derivative (Kd) constant values were mentioned. These are the values which provide the tuning for the PID control system. 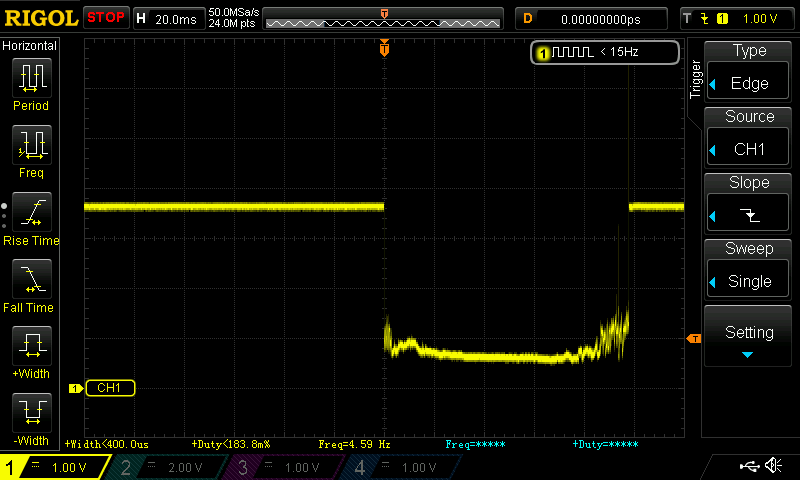 The next constant is the set point, this was observed as the read ADC value, when 9V was present on the output. The 9V was measured and adjusted using a multimeter with a fixed load on the output, the duty cycle had a fixed value which was then increased until 9 volts was reached. The first 2 global variables are used to store the accumulated and historic error values required for integration and differentiation. The global variable PWM_Temp is initially given a value, then this is used to store the old duty cycle value, which is then used in the new duty cycle calculation. The next set of variables are all local to the PID function called PWM_Duty_Change(), all the code that follows will be inside this function, until the closing brace of the function is stated and mentioned. Additionally the entire code which was used on the LM3S6965 can be downloaded (bottom of the page), so it can be seen how and when the function was called. The first 2 local variables are called iMax and iMin, these are used to prevent integral windup. 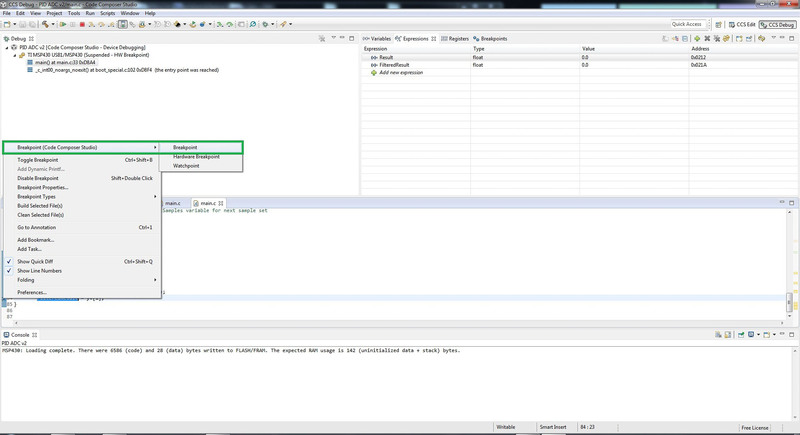 More will explained on integral windup further in the tutorial, but for now we will just run through the variables. The next 4 variables have already briefly been touched upon in part 1 of this tutorial, these are Err_Value, P_Term, I_Term and D_Term. 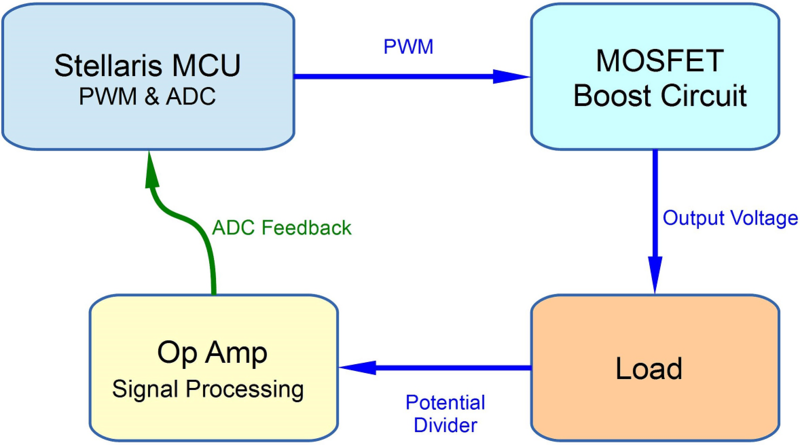 Then we are left with new_ADC_value which is simply the latest sampled value form the ADC, and finally PWM_Duty which will be the new PWM duty cycle value passed to the timer module. The read ADC code does not need much explanation, other than a function was created to read the ADC and return the value as an integer. If you are using this code on another microcontroller, you simply need to construct an ADC read function, then insert instead of the read_ADC(). Going back to part 1 of this tutorial it was shown that the error value can be obtained, by simply taking the newest error value away from the set point, that’s all this line performs. To obtain the proportional term the Kp constant is multiplied by the error value. The accumulated error value is used in integration to calculate the average error, so first the current error value must be added to the accumulated value, and that’s what this line performs. The if and else if statements are used to cap the accumulated integral term, by simply setting upper and lower thresholds. The integral term is then calculated by multiplying the Ki constant with the accumulated integral value. The first line of this code snippet calculates the derivative term. To understand how the code works the second line needs to be run through quickly, this basically assigns the newest ADC value to the d_temp global variable. So the d_Temp variable effectively stores the historic error value, therefore allowing the derivative to be calculated. Now looking at the first line again, the newest ADC value is taken away from the historic value, the difference between the 2 would allow the rate of change to be calculated (assuming the time between the readings is a known quantity). Then this value is multiplied by the derivative constant and assigned to the derivative term. Now that we have all the PID terms calculated, they can be used to change the PWM duty cycle. This next piece of code adds all the PID terms together, then they are subtracted from the PWM_Temp variable (PWM_Temp usage is shown shortly as it comes towards the end of the function). 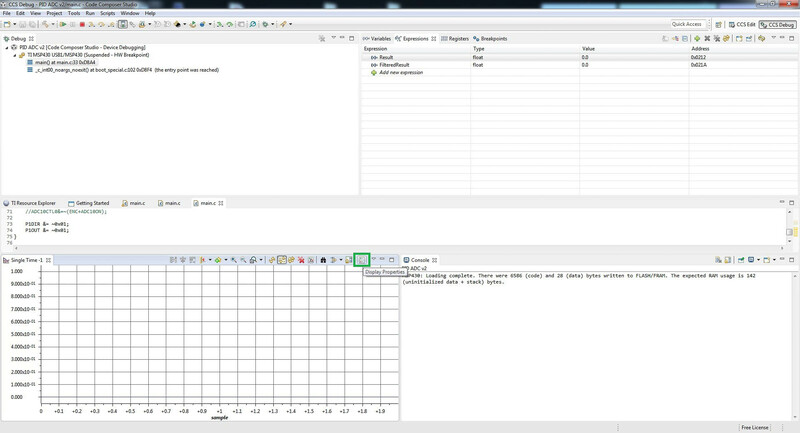 This value is then assigned to the PWM_Duty variable. The way the PID terms are used here is specific to this program, firstly the sum of the PID terms is subtracted, this is due to the final electronic circuit used. What’s important here is the PID terms are summed, then they need to be used in such away as to construct a valid PWM duty cycle or other chosen control method. The if and else if statements are used to prevent the duty cycle from going too high or too low, in this case this simply prevents the output voltage from going too high or too low. If say you were using a half bridge driver integrated circuit, these usually state a maximum duty cycle of say 99%, if this is exceeded the voltage doubler cannot function correctly, so having limits can be a good protection system. This line is again limited to this specific application, it simply calls the function adjust_PWM(), which has the new PID calculated duty cycle value, as a parameter. The final statement in the function before the closing brace, assigns the current PWM duty cycle value to the PWM_Temp global variable. Integral windup can occur if the integral term accumulates a significant error, during the rise time to the set point. This would cause the output to overshoot the set point, with potentially disastrous results, it can also cause additional lag in the system. The integral windup prevention used in this example, places a cap on the maximum and minimum value the integrated error can be. This effectively sets a safe working value and is considered good working practice in any PID system. The values used for integral windup as with the PID constant gain values are specific to this system, these would need to be determined and tuned to your system. The intention was to also explore the well documented Ziegler-Nichols approach, however time constraints for the project did not allow this method to be fully explored. Some basic concepts of how to carry out a step response test will be shown, as I am sure it will prove useful. The free GPIO pin would be connected to channel 2 on the oscilloscope, and in this way can be used as a trigger to start a capture event. Channel 1 on the oscilloscope would be connected to the output of the boost converter, thereby capturing the step response as the output voltage rises. 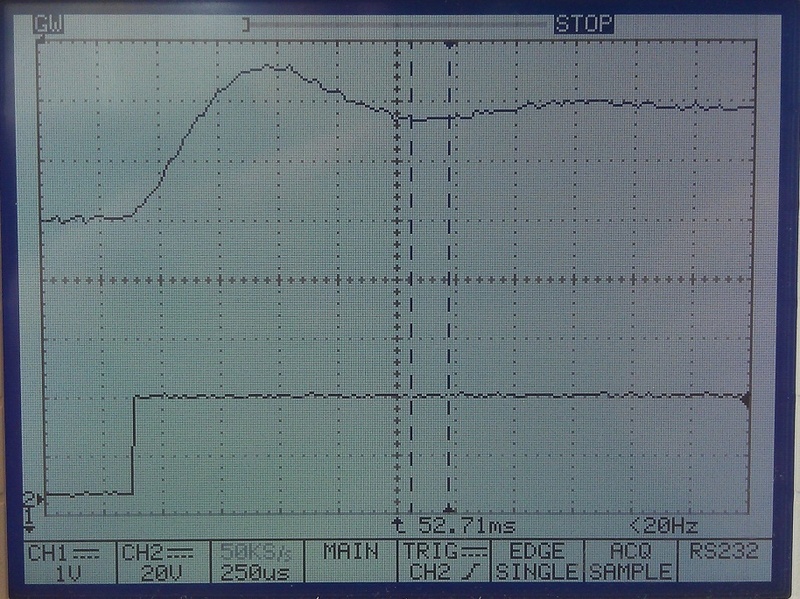 The image below is a photograph of the captured step response on the oscilloscope. The GPIO pin was polled before the PWM duty cycle was updated, however this happens so quickly, it is difficult to distinguish this. 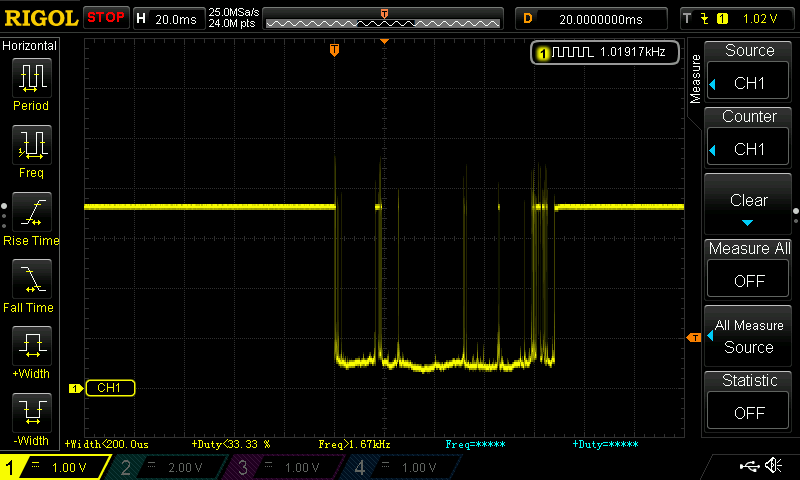 The lower square wave type step is the GPIO pin on channel 2, and the top curved step response is the output from the boost converter. It can be seen to overshoot it’s settling level at the beginning then oscillate for a time before settling down, this oscilloscopes accuracy wasn’t the best, using a longer time base did not show any extra detail on the oscillations. If the step response was of a first order, a calculation based on the reaction curve could be performed. 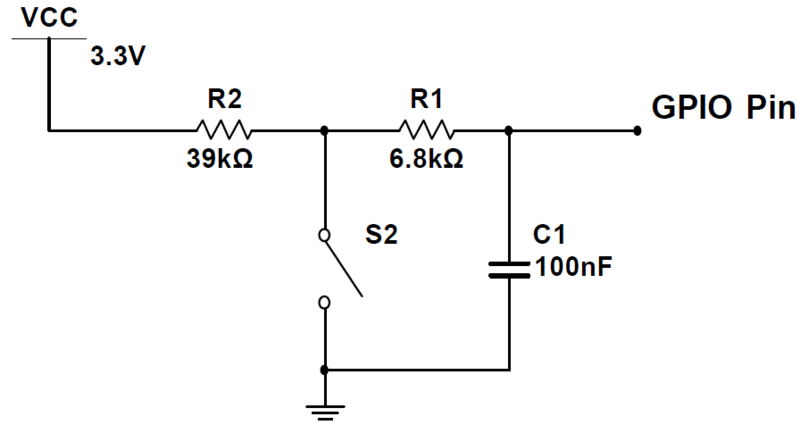 However the step response from the boost circuit is of a second order, and has an under-damped nature. In order to explore this calculation further, requires another tutorial altogether, however further reading on this can be found here. The step response of a similar system under the control of a PID controller can also be viewed. 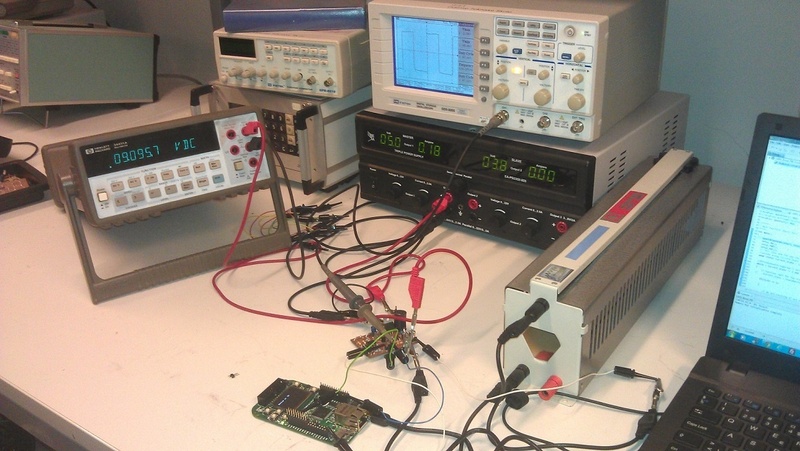 This can be achieved by using a similar set up, the external pin is used again to trigger an oscilloscope capture. That same GPIO pin is also used to switch a mosfet, which places an additional load in parallel with the output of the boost converter. The PID algorithm will then regulate the output voltage to ensure it meets the set point with the new load, and the step response can then be captured. The system was set up and a basic tuning approach was used, the image below shows the system on the test bench. With everything connected the PID algorithm was set up, but with only the proportional part in operation. The set point was set to 353 as mentioned previously, which produced close to 9V give or take 10-15mV. The load was fixed and set to 100Ω. Initially the proportional gain constant Kp was set very low around 0.001, this was too low so it was increased over a few steps until 0.01. At this point the output voltage was observed to be approximately 7.5V, and the duty cycle waveform was observed to have a small amount of jitter, as the duty cycle fluctuated +/- 0.5%. The Kp value was again increased, until the output voltage read approximately 8V, the duty cycle was again observed and found to be fluctuating by a greater amount, by approximately +/-5%. The increase in jitter on the PWM duty cycle can be equated to greater oscillations on the output voltage, the multimeter was not suitable for observing these. It would have been possible to see them on the oscilloscope but this probably would have involved a stop capture then restart method, therefore to make the process quicker the PWM duty cycle was considered ‘good enough’. 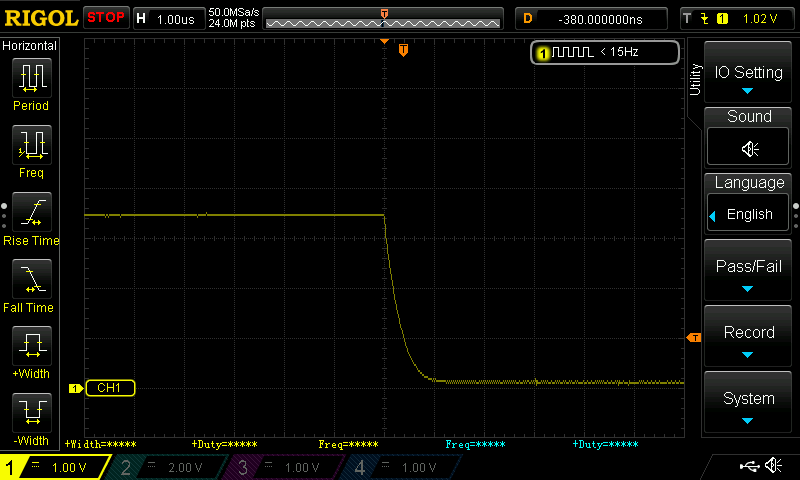 At this point the Kp value was backed off, to the previous level of 0.01 so the output voltage was at 7.5V. This point can be considered close to the offset level mentioned in part 1 of this tutorial, and for ease of reading the image showing the offset level can again be seen below. This image also illustrates again how too larger Kp value can introduce instability in the output. Now with this level reached, the integral part of the algorithm was introduced. All the hardware was untouched, just a simple modification to the algorithm was made. The initial value chosen for Ki was 0.01. This was then loaded on to the LM3S6965 and the output voltage on the multimeter was immediately observed to read 9.02V, +/-10mV. The oscilloscope was also observed to have minor jitter as before of only a few half percent. The integral value was not tweaked any further, but in most cases tuning the Kp and Ki values would take a greater time and under a wide range of conditions. With the PI controller working on a basic level, the next test was to see how it performed under different load conditions. First the bench potentiometer was left at 100Ω and the input current and output voltage were noted, the wiper was then moved to the middle (approximately 50Ω) and again the output voltage and input current were noted. At 100Ω the output voltage was 9.02V with a current of 180mA, at 50Ω the output voltage was 8.99V with a current of 500mA, both output voltages still showed minor voltage variations in the +/-10mV range. After this test, the derivative constant was introduced and tweaked to find the best settings. The Kd constant was not observed to have a huge affect on the system, unless increased dramatically which produced instability. This set up is not ideal for testing the derivative term and a more detailed and longer term approach would be best. The basic test performed seemed to conclude the PI controller was working as per the research carried out. The system used here updates at a very fast rate, therefore observing the step response at this point would be best practice. As this system has no critical importance other than to explore PID, it simply wasn’t necessary to tune it to a high degree of accuracy. I have a number of projects in the works however, which touch on this subject again and I intend to post them when I have time. The link below contains the zip file with the complete C code and an external functions folder, there is a small advert page first via Adfly, which can be skipped and just takes a few seconds, but helps me to pay towards the hosting of the website. 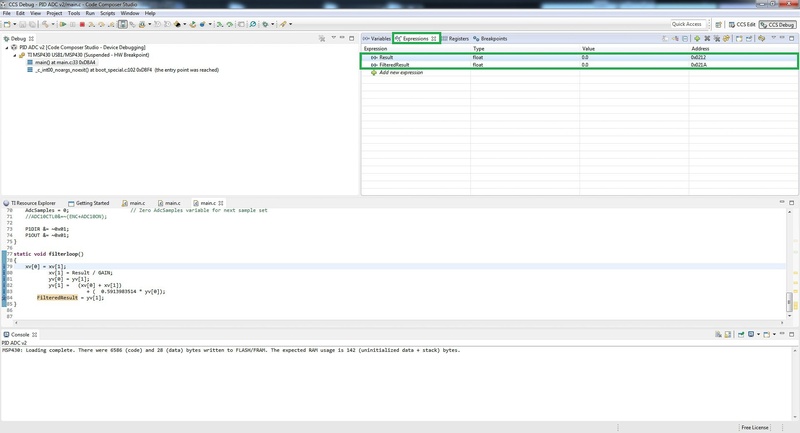 In this PID tutorial C code example Pt/1, the basic concept of a PID controller will be explored. The full example code is implemented on a Stellaris LM3S6965 microcontroller, and is used to control a simple boost converter circuit, regulating the voltage with a change in load resistance. The boost circuit is not covered in-depth in this tutorial, but the fundamentals of a boost circuit are covered. In this first part the basic concepts of a control system will be explored, as well as the PID controller. The second parts covers the code implementation in the C language on the Stellaris LM3S6965, all the code is stepped through and can be downloaded at the end of the second part. To understand how PID controllers are used, it is important to first understand some basic control system principles. The image below illustrates the 2 basic types of control system. 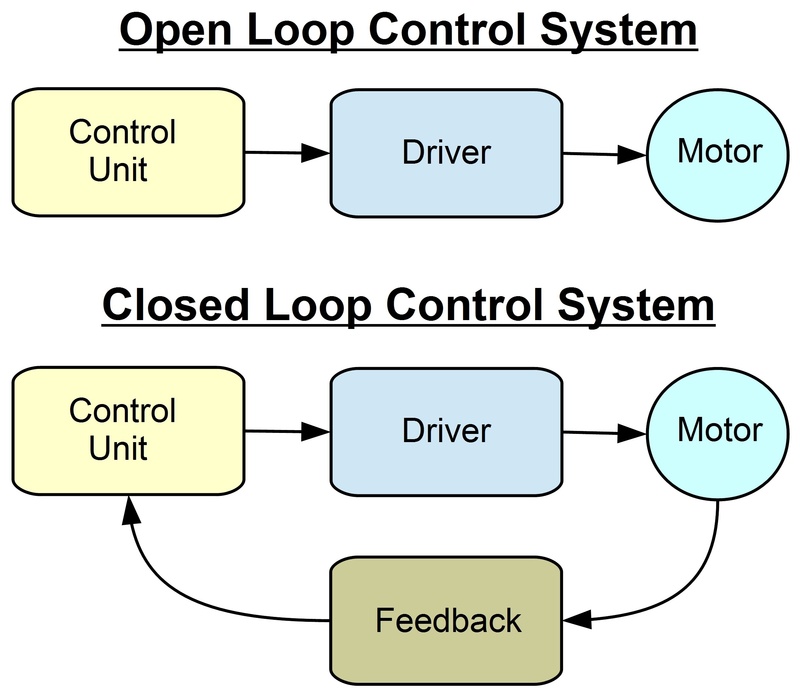 The open loop system can clearly be seen to have no feedback, therefore if the load changes on the motor, the motor speed will change. The control unit cannot command the driver to increase or decrease the power to the motor, as it has no knowledge of the speed change induced in the motor, by the change in load. The closed loop system however has feedback from the motor. So if the motors speed were to decrease due to an increase in load, the control unit could command the driver to increase the power to the motor, keeping a constant speed. Common direct current motor control is achieved via PWM, and simply increasing or decreasing the duty cycle will increase or decrease the motor speed. We will come back to the Error_Value shortly as this is used in the PID controller, but first lets look at a more simplistic approach using the threshold level. If threshold levels are used, lets say to keep the motor speed between 1200-1300rpm, the feedback signal could be directly used as a comparison. Therefore if the feedback signal is 1320rpm the control unit needs to decrease the motor speed. If we now said the control unit was a microcontroller, and the driver was a simple amplifier. The microcontroller could reduce the duty cycle of the PWM, this in turn would then slow the motor down. If we consider the motor to have a very quick response to changes in PWM drive, and the load on the motor to alter subtle over time, then there are 2 important factors to consider. (1) The speed at which the PWM duty cycle is updated by the microcontroller, and (2) how large a change is made to the duty cycle on each update i.e. 1%, 5% etc. This control system is often known as an on/off controller, the 2 factors can be tuned to suit the individual control system. An example of on/off controller which is slightly more complex than this example, as it has other parameters is a Perturb and Observe algorithm used in a solar MPPT for photovoltaics. 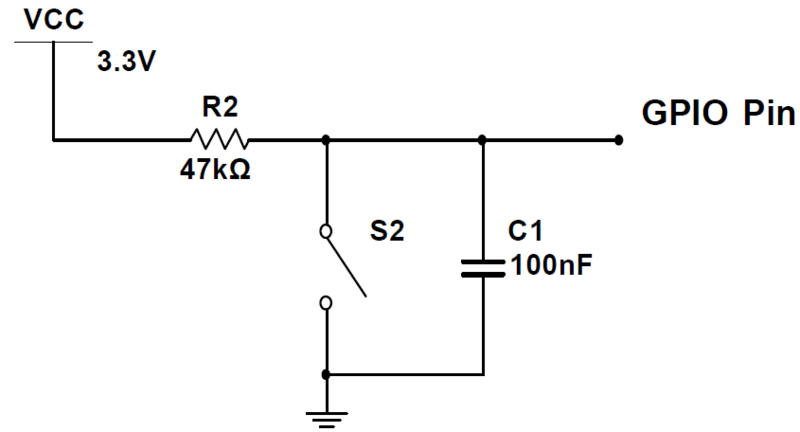 The image below shows how an on/off controller usually oscillates around the set output level. On/off control systems typically oscillate around the desired output level, as they overshoot and undershoot the desired value. The threshold level example used has no fixed setpoint so even if the motor speed stayed within these bounds, its speed would still oscillate to some degree. 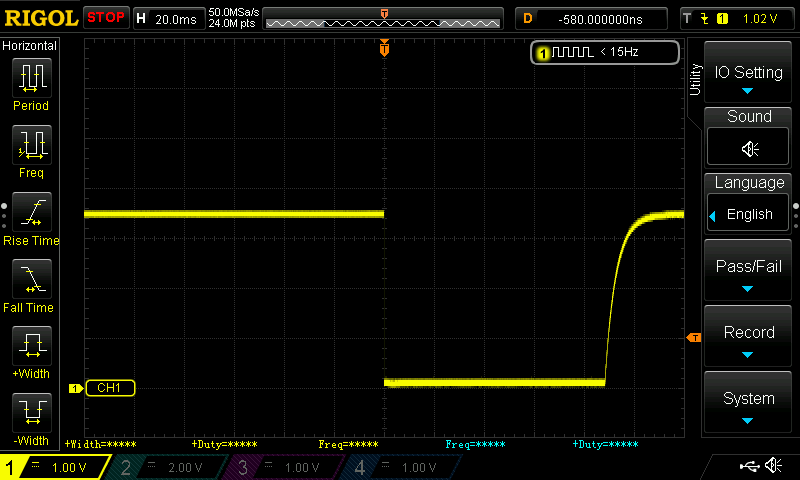 The size of these oscillations is dependant on the PWM step size and the control loop speed. If the system is very dynamic and changing at a fast rate, then a compromise between these 2 factors needs to be reached, to ensure good tracking performance. 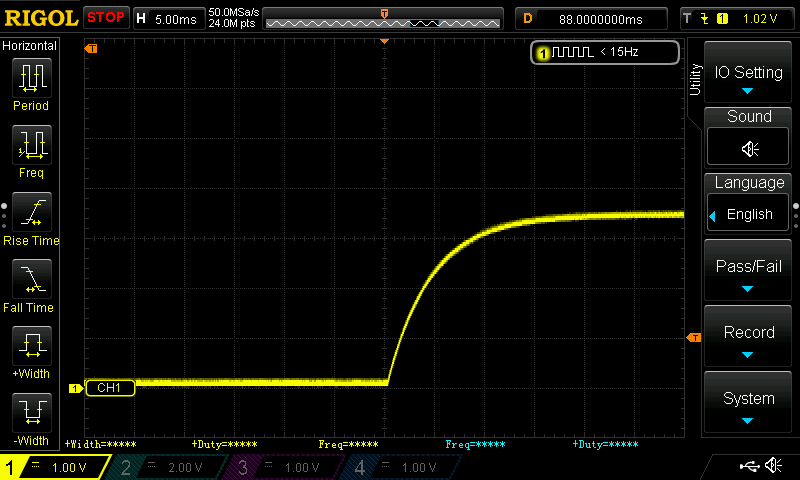 When the desired reference value is reached, the size of the oscillations will be dependant on the PWM step size. PID stands for Proportional, Integral and Derivative. PID controllers have been used since the 1890s, and were originally developed by Elmer Sperry for an automatic ship steering system. A PID control system uses 3 gain constants, which are multiplied with the Error_Value. 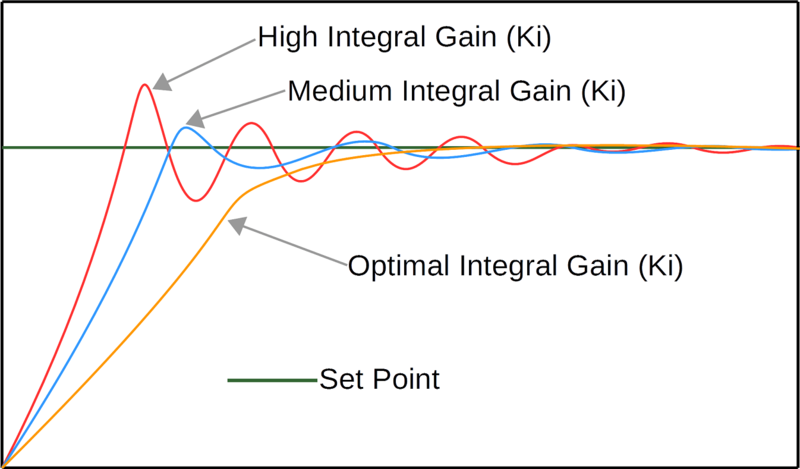 The proportional value gain constant is referred to as Kp, the integral value gain constant as Ki and the derivative value gain constant as Kd. The results of these multiplications produces 3 further values, for this tutorial these are referred to as the P_term, I_term and D_term. As previously mentioned the Error_Value can be obtained from simply taking the New_Feedback_Value away from the Set_Point. In a PID controller the error value can simply be multiplied with the Kp constant, but for the Ki and Kd constants a different approach is required. In order to calculate the I_term and D_term historic error values are required. The I_term is using integration which gives the average error value over time, and the D_term is using differentiation which gives the rate of change of the error value over time. Once all the PID terms are calculated, these new values are then summed together and used in the final control output. The P, I and D terms have different affects on the final system performance, and need to be tuned to the individual control system. The ultimate aim for any control system is to respond as quickly as possible, without excessive overshoot and oscillations around the set point. The system response ideally needs to reach a settled state as quickly as possible, the settled state is very subjective and dependant on the application. A block diagram of a PID control system can be seen below. The proportional term (P_term) provides an output value which is proportional to the current error value. The Kp constant value determines how large the gain response will be to the current error value. 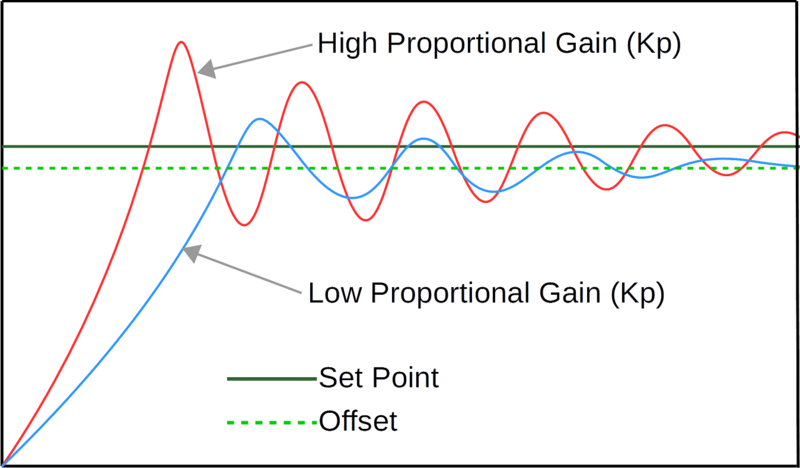 A high proportional gain constant will induce a large change in the output, often overshooting the set point level. If the gain is too high the system can become unstable and excessive oscillations can occur. Another affect of a high Kp constant is faster response time, vice versa a low Kp constant will result in a slower response time. When a low Kp constant is used, there will still be oscillations and some overshoot of the set point depending on the level, however these will not be as aggressive. A low Kp value will also settle in an offset position slightly below the set point level, this offset position can be used when tuning a PID system. The image below illustrates the step response waveforms of a system with high and low Kp gain constants, on a hypothetical control system. The integral term (I_term) is used to bring long term precision to the control loop. It is proportional to both the magnitude and duration of the error. Using Integration allows for the average error to be calculated, as the sum of the instantaneous error over time provides an accumulated offset. The accumulated error is then multiplied by the Ki gain constant, allowing the offset which should have been corrected previously, to be added to the controller output. This then accelerates the controller output response towards the set point, eliminating the offset found when just using a proportional control value. As with the the Kp gain constant the Ki constant, needs to be tuned. If the Ki value is too high the system will have a faster response time, but it will also be likely to overshoot the set point, inducing further unwanted oscillations before finally settling. An ideal Ki value produces a response time that is fast enough for the application, with little or no overshoot and a quick settling time. The image below illustrates the step response waveforms with a tuned Kp value already set, then a few Ki gain constants are applied on a hypothetical control system. The derivative term (D_term) is the least used of the three terms, most controllers are based on PI control algorithms. Introducing the Kd term is generally used in specific control systems, these are usually where overshooting the set point can cause dangerous results. Differentiation is used to determine the rate of change, by using the instantaneous error value and the previous error value, so a rate of change can be determined. The derivative term can be used to predict system behaviour, improving settling time. As can be seen the constant gain values Kp, Ki and Kd all affect the control system in different ways, therefore careful tuning of these values is an essential part of an effective PID controller. Tuning a PID system is a difficult problem, there are only 3 parameters but finding a balance often takes some time depending on the complexity of the system. Some systems have auto tuning features, but in some situations to have the best performance from a system, it is often recommended to manually tune. A well known tuning method is called Ziegler-Nichols, developed by John G. Ziegler and Nathaniel B. Nichols. This relies on the Ki and Kd gain constants first being set to zero. The the Kp constant is adjusted until it reaches the ultimate gain, which is classified by the output from the control loop oscillating at a constant amplitude. Then the ultimate gain value and oscillation period are used to calculate the Ki and Kd constants. More about the Zieglar-Nichols method can be found here. There are other methods and simply searching on Google will yield many results. 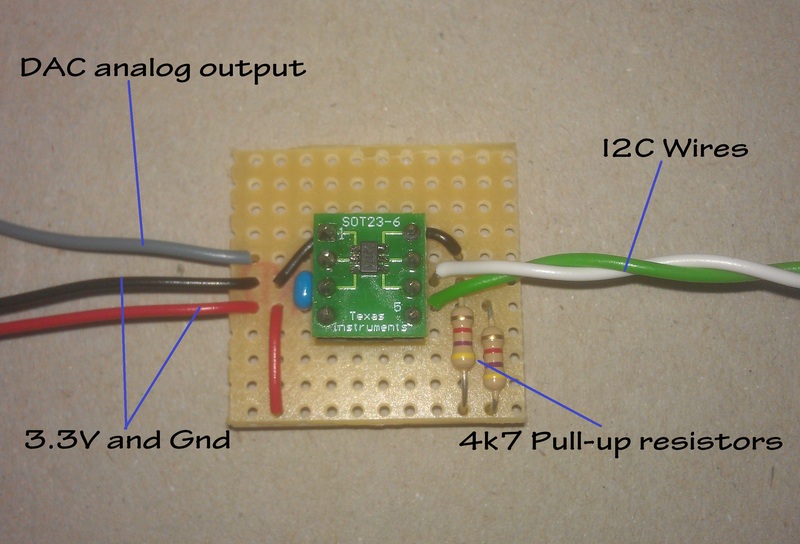 The C code, set-up and tuning of the boost converter will be covered in part 2 of this tutorial. In this Stellaris timer example two timers are used to code a basic frequency counter. The code process is quite simple to implement, and as mentioned previously with other stellaris examples I would recommend using the StellarisWare Peripheral Driver Library PDF as a reference, which can be found here. The first timer is configured to count the leading edge of the incoming square wave, the second timer is used to count for a fixed time and then generate an interrupt. Then a simple calculation is performed using the second fixed timer value, and the accumulated leading edges counted. The positive going edge count is then stored, and also reset every time the second timers interrupt is generated. The image below outlines the basic operation of the example that will be shown. As can be seen from the image timer 2 was chosen to generate an interrupt every 100mS, this was deemed as an adequate time to refresh the count, and can easily be increased or decreased pending on the application. The stellaris LM3S clock frequency is running at 8MHz. Each clock pulse period can be calculated by taking the reciprocal of 8MHz (1/8MHz) which is 125nS, then dividing 100mS by 125nS we reach a value of 800,000. The 800,000 is not used directly in this code, as the clock is simply divided by a constant, but this illustrates how the value was reached. A signal generator was used to feed a square wave into the stellaris, this was then varied and the results of the stellaris code displayed on the on-board OLED. A video of the frequency counter in action can be seen below. So now lets dive into the code. As mentioned before the system clock was running at 8MHz, using the on-board crystal, the code snippet below is used to configure the clock and also some OLED initialisation. // Set the clocking to run directly from the crystal. // Initialize the OLED display and write status. Then both of the timer peripherals need to be enabled. // Enable the peripherals used by this example. In the code example Timer0 is used to generate an interrupt every 100mS, and Timer1 is used to measure the leading edge pulses from the signal generator. Therefore a GPIO input needs to be setup and assigned to function with Timer1, the next section of code performs this. // the pin for its Timer functionality depending on the part that is defined. An interrupt needs to be enabled and set-up for Timer0A. 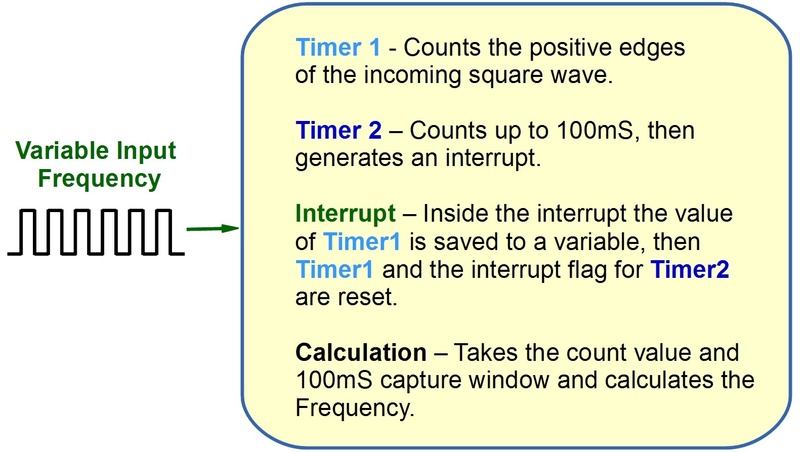 // Setup the interrupt for the Timer0-TimerA timeouts. Then the 2 timers need to be configured. The first 2 lines of code set-up Timer0 as a full width periodic timer, and Timer1 as a half-width edge count capture. Then Timer0 (TimerA) is loaded with the 100mS count period, and Timer1 is loaded with a value of 10000. Timer1 is loaded with a value as it counts down for every positive going edge. This timer example could effectively count upto 2MHz (a quarter of the 8MHz clock frequency), it was tested successfully with higher frequencies, to do so the value preloaded into Timer1 needs to be increased. The final line in this snippet, sets Timer1 (TimerA) to trigger on positive going edges. 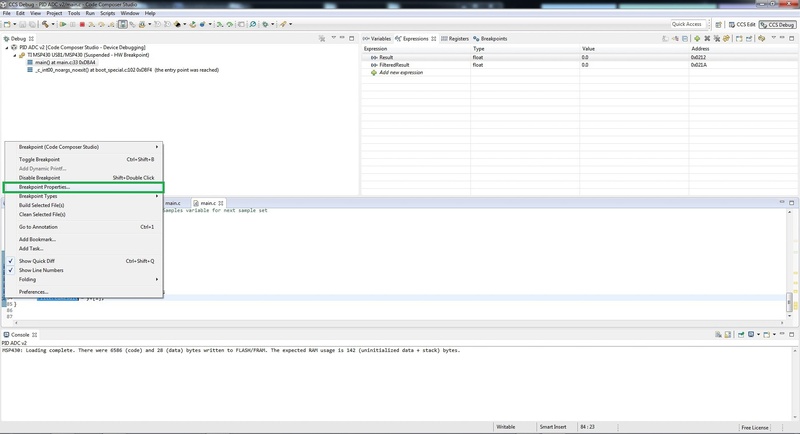 // Configure the two 32-bit periodic timers. // then the value is immediately loaded into the timer. // timer when in capture mode. Finally the timers need to be enabled. 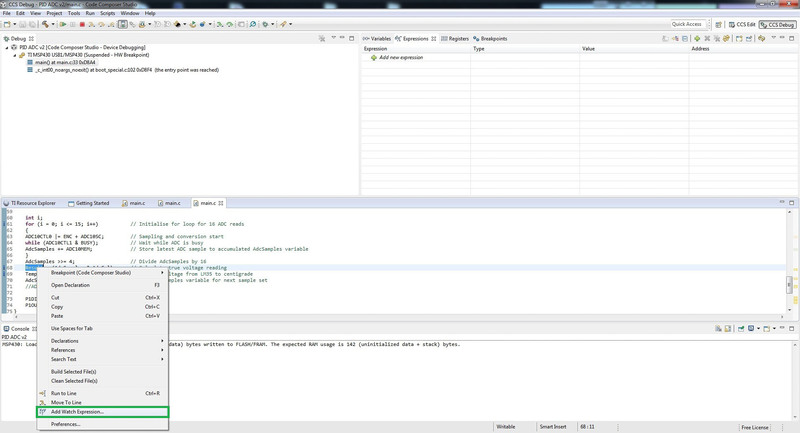 Now that the timers are configured and enabled the code for the interrupt handler for Timer0 can be configured. This basically clears the interrupt, stores the value counted by Timer1 and then resets Timer1. // The interrupt handler for the first timer interrupt. // Clear the timer interrupt. This is not necessarily the best way to do this, but it performed the task required of the test at the time. 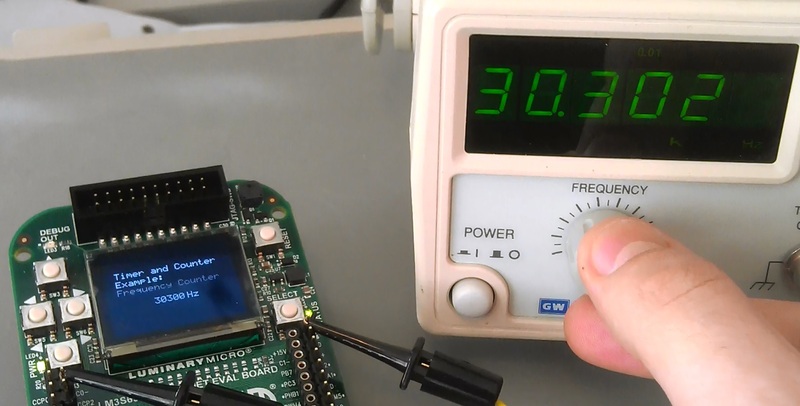 As has been mentioned the code displays the frequency value on the OLED, to do this an itoa function is used to change an integer into a char and then print to the display, all this takes quite a few processor cycles, and in this way has been removed from delaying the interrupt handler. The final code block shows the function used to calculate the timer frequency. It could be improved upon using a modulus to display the frequency in kHz, and printing a decimal point in the appropriate place, this would allow displaying a greater range of frequencies with more ease. The following image shows a screen capture from the YouTube video, which demonstrates the program works within a reasonable accuracy. The link below contains the zip file with the complete C code, there is a small advert page first via Adfly, which can be skipped and just takes a few seconds, but helps me to pay towards the hosting of the website. The Stellaris DAC7571 tutorial will show how a LM3S6965 evaluation board is interfaced to the DAC7571 using the I2C bus. The DAC comes in an SMT package, TI supply SMT prototyping boards which allow the DAC to then give the footprint of a standard 8pin DIP package. This method is useful as it allows the DAC to be used in various other projects and easily reused. The image below shows the completed prototyping board, fitted to small veroboard used for testing the I2C bus. This is not a tutorial on I2C but it is necessary to give a brief decsription of the protocal, as these leads into explaining how to communicate with the DAC7571 correctly. The datasheet for the DAC7571 can be downloaded from here I2C is a 2 wire protocol using a data wire (SDA) and a clock wire (SCL). There is a Master device which initiates contact with up to 127 Slave devices on a single bus, each slave has an individual 7 bit address. There can be more than one Master on a bus, but this is beyond the scope of this project, so will not be covered here. For this project the master will be the LM3S6965 and the DAC is the slave (the DAC can only be a slave). There is a certain sequence of events for any data bus, which is covered briefly in the next few lines. The SDA and SCL lines when in idle state naturally sit high or logic level 1. The master initiates contact on the bus by pulling the SDA line low, when the SCL line is still high, this indicates to any slaves on the bus serial data transfer has started. After this the master generates the serial clock on the SCL line. The master then sends out an address byte of the slave it wants to communicate with. After sending out the address byte the master generates a ninth SCL pulse, then monitors the SDA line during the high period of this ninth clock cycle. The SDA line should now be pulled low by the receiving slave during the high period of the ninth clock cycle, this is an acknowledge signal and lets the master know the address sent successfully matches a slave on the bus. Further data bytes can be sent to or read from a slave by the master, using the a similar method to the steps explained. The I2C protocol has fairly strict timing requirements, so it’s important to note while the bit stream is generated, the master ensures the timing for valid data. The DAC7571 datasheet contains a great deal of information about interfacing, and all the necessary information regarding the I2C interface can be found on page 13 to 18. It is only possible to have 2 of the DAC7571 devices on one I2C bus, this is due to the way the slave address is set on the DAC. Pin 6 is called A0, pending how this pin is connected determines the address of the DAC, if the pin is connected to Gnd the slave address is 1001100 (0x4C), if A0 is connected to Vcc then the slave address will be 1001110 (0x4E). A0 for this project was connected to Gnd. Now that the address is taken care of, it was necessary to understand how to send data to the DAC. 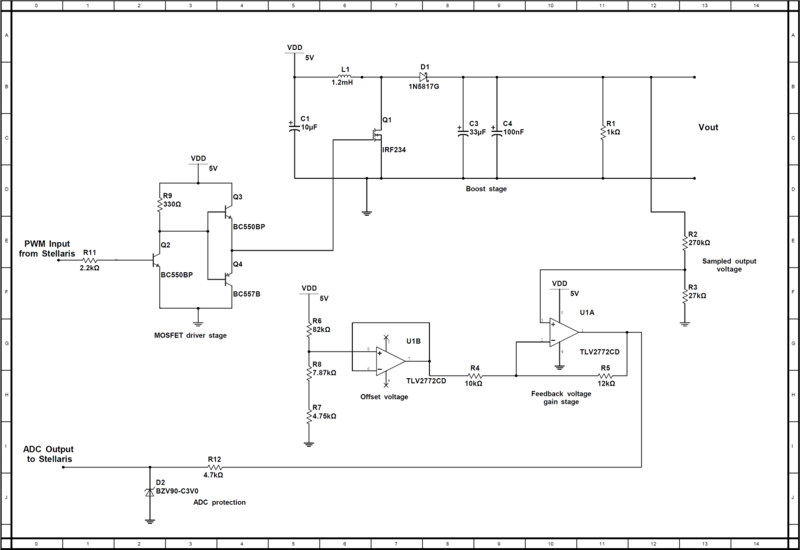 The image below is taken from page 17 of the datasheet. From the table it can be seen that 2 bytes of data need to be sent to the DAC, so this is effectively makes up 16 bits. The first 4 bits are used for control data, the remaining 12 bits are used to set the DAC value, hence it’s a 12 bit DAC. The first byte starts with two zeros then contains two control data bits, the last 4 bits of the first byte contain the first 4 bits of a 12 bit word. The second byte contains the last 8 bits of the 12 bit word. The image below demonstrates how the data is broken up. The Stellaris has a library specifically written for the I2C protocol contained within the TI software bundle StellarisWare, this makes interfacing with devices which support I2C and many other protocals much easier, compared to lower end microcontrollers like the MSP430G series. An essential read is the Stellaris Peripheral Driver Library in PDF format, which can be downloaded from here. There are sections dedicated to all the driver libraries, this document was referenced heavily for this project. In order to use I2C on the Stellaris, the peripheral must be enabled (there are two I2C ports on the Stellaris I2C0 and I2C1). Then the port the peripheral is on must also be enabled, followed by the individual pins on that port. The following functions below carry out the port enabling. Once the ports have been enabled the I2C needs to be initialised, via the following function which also sets the speed of the bus (false indicates 100kHZ). After this the microcontroller can begin it’s duty as master, the code below can be used to test the DAC. Further code was written using a function with all the code below placed inside, then the function was simply passed parameter values to set the DAC output voltage. 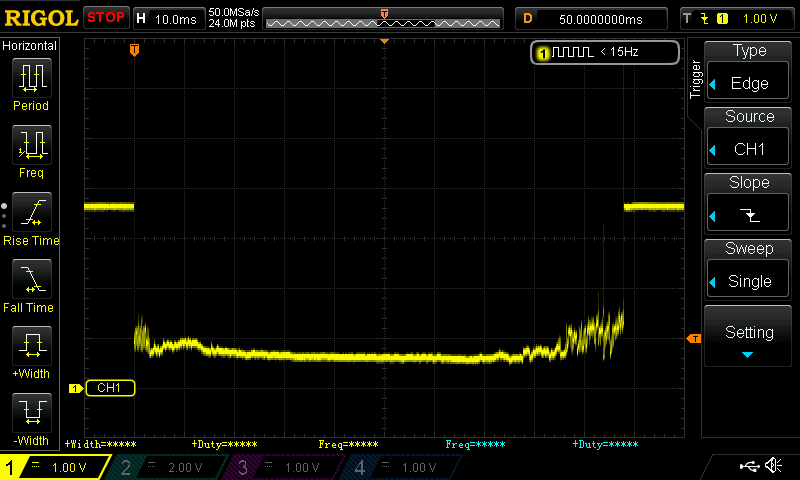 The DAC supply voltage is 3.3V, therefore 3.3V/4096 = 806μV per step, so a value of 1532 for example should be as follows 1532*806μV = 1.235V When the above code was written into a test program, 1.24V was observed on the multimeter. The Hex values of 0x05 as the first byte and 0xFC on the second byte equate to a 12 bit binary value of 010111111100, which is equal to 1532 in decimal.